The Primate Assessment Pack includes a Traditional Test and a Student Centered Portfolio/Reflective Journal Test. 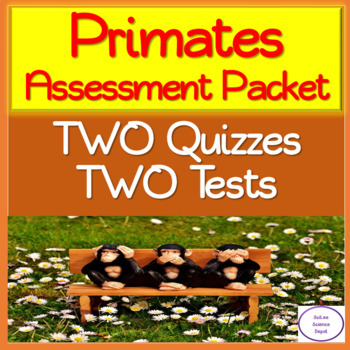 The Primate Test is the Summative Assessment for the Primate Lessons and Activities I have on my TpT Store. There are 20 multiple choice questions, 10 matching questions, and two open response/essay type questions. The instructions tell the students they have to answer one of the two open response/essay type questions. They are given an option of answering both of them correctly for bonus points. I do this to encourage the students to take the time to complete this type of question. The test is in a PDF format, with the answers. I have also included an ExamView Pro file of the test so you may modify it if you have the program. 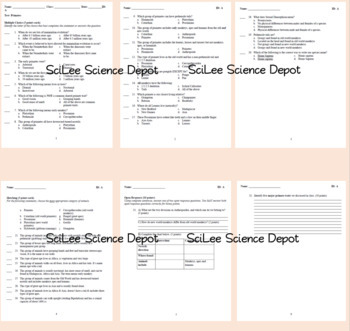 The Primate Portfolio/Reflective Journal is an assessment tool where the STUDENT picks how they want to show you they have mastery of the subject.